Dr. Kahrhoff joined Complete Vision Care in 2009. Prior to joining, he served in the USAF at Keesler Air Force Base, where he founded a specialty contact lens service and directed the Student Extern Program with responsibility for clinical training of optometry students from across the country. 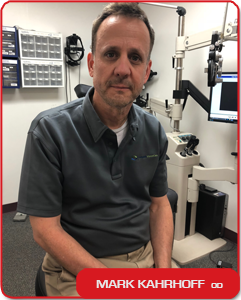 Dr. Kahrhoff has taught at the University of Missouri College of Optometry in the areas of systemic and ocular pharmacology, ocular anatomy and physiology, physiological optics, and problem-based clinical analysis. He has developed contact lens education programs for Air Force optometrists and ophthalmologists and lectured military physicians on evaluation of eye trauma. Dr. Kahrhoff is a lead author and inventor on multiple patent applications filed with the US Patent Office for innovations in ocular drug delivery and regenerative ocular medicine. Dr. Kahrhoff was among the first optometrists to provide platelet rich plasma therapy to patients with dry eye diseases. He is a co-inventor of “The Electronic Eyelid,” a prosthetic blinking device designed for a child who had lost his ability to blink due a brain tumor and “The Freedom Reader,” a low vision aid that converted printed text to speech. Dr. Kahrhoff practices the full scope of optometry and enjoys seeing patients of all ages. He resides in Webster Groves. He is currently accepting patients at Webster Groves on Wednesdays, Thursdays, & Saturdays, and at Festus on Mondays, Tuesdays, Fridays and Saturdays.